Latest refinements on my small hinge making process. First, an upgrade on my router sled which allows better control and smoother sliding with excellent accuracy. 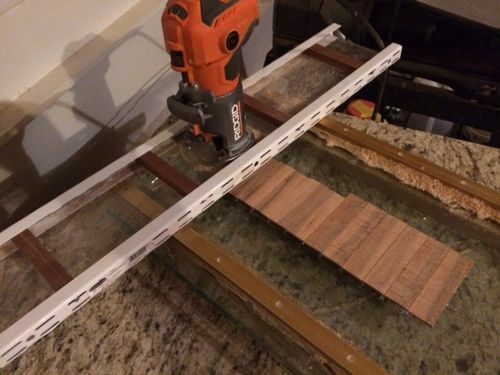 That Ridgid router in the picture is still going strong after years of heavy use. 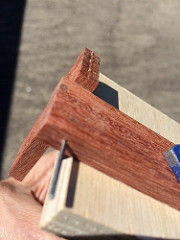 Set up to plane maple hinge halves to 1/8”. I want to cut down the time it takes to make these so I need to develop standard procedures with detail. So, after planing they are cut to identical lengths and widths. When I am trimming these to width I use a rubber sanding block (with the nails removed) taped to a rubber sanding contour form. This technique is highly stable and controllable. See picture. 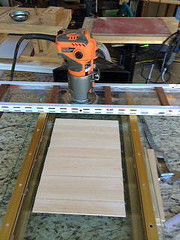 Part II discusses how I further prepare pieces for gluing. 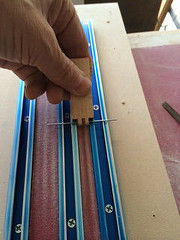 I have made some improvements in clamping jigs as you can see in picture below. After glue-up I load a .0465 drill bit in my drill press and by hand run the pre-made hole in each piece over the drill bit a couple times. After that I then take a piece of roughed up (with wire cutters or file) .047 music wire install it in the drill press and ream out each hole. I want some resistance but not to much. something you get a feel for. Then comes squaring up again and marking for the exact lengths to be cut. This is important and I have spent a lot of time getting this right and now have a procedure which is consistent and accurate. As in the picture I hold two hinges together with pivot wire. ( .047 ) Turn one perpendicular and use the thickness of one to determine the length past pivot hole on the other one. For accuracy I use a scalpel to score the cut mark. Then set it up for cutting. This is demonstrated in next two pictures. Once these are done and they should be very close to dead on because it will make the rounding task much much easier, hinges are ready for cutting finger joints. 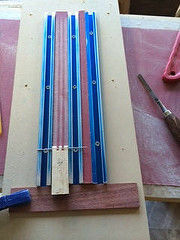 To maintain more accuracy on the joints I built a sled for 3/32” joints, one for 1/8” joints and one for detailed and accurate small part cuts. The idea for the sleds came from a You Tube video by Laney Shaughnessey. I simplified and adapted somewhat for my purpose. 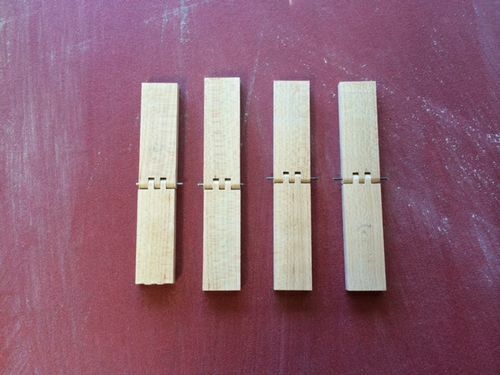 Okay, I will be putting three and two fingers on the pieces that fit together. The piece that will have the three fingers I make the first cut a little off center on the small parts sled. 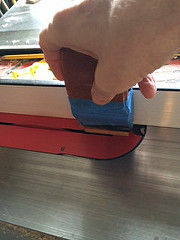 The cut is made deep enough to fit over the slot nub on the 1/8” sled, but not the full depth of cut. 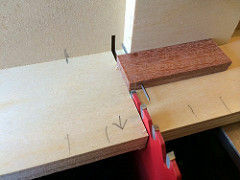 I use the opposite ends of my hinge pieces for trial cuts to make sure everything balances out. You want to have approximately the same distance on the outer fingers of the male pieces. They are designed to be shaved down balancing each side to equal proportions for fitting in the mortice. Then comes the rounding. 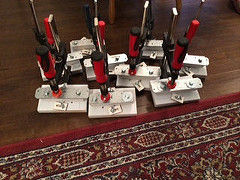 In the picture are the jigs I have put together for better control in this process. It works surprisingly well. The rails are adjustable for width of hinge. The narrow slot is for starting the female half of the hinge. I attached sticky backed sandpaper to both sides of a wood slat that was thicknessed to a little undersized what would be needed. Then I can zero in on exact height with different grits of sandpaper strips. See picture below. This is a picture of two sets of completed maple hinges .2615 approximate thickness 1/8” joints designed to fit into existing mortice. About two and one half hours from start to finish. Your efforts are improving the process Dan. I am taking notes as I may give these a try. A wood hinge on a box gives it that special personnel touch. Nice thinking. I like the wood hinge look. Ever since Ruddy inspired me to try making some wood hinges its been down the rabbit hole, so be careful, it can be addicting! Thanks for posting this blog. It is always pleasing to see how different people approach a process and what you have come up with here is very clever. An excellent blog. Thanks Ruddy! Your blogs were a great help for me. Everyone interested in hinges should definitely be reading them. Here is another picture of thickness jig.